The first-ever field observations of Omura’s whales, the world’s rarest whales, have been made by an international team of scientists off the coast of Madagascar. The biologists, who published their research in the Royal Society Open Science journal, described the giant animals’ vocal and foraging behaviors, as well as their habitat preferences in the shallow waters of coastal Madagascar. For several years, these marine animals, which are also known as dwarf fin whales (Balaenoptera omurai), were mistakenly identified as Bryde’s whales due to their similar appearance – both are small and have comparable dorsal fins, though Omura’s have unique markings, are slightly smaller, and have a lower jaw that is dark on the left side and white on the right. After using genetic samples obtained from old whaling expeditions and some stranding in the western tropical Pacific, scientists determined in 2003 that Omura’s whales were a distinct species. However, there had not been any confirmed records of Omura’s sightings in the wild and very little else had been known about the mysterious species – that is, until now. Cerchio is also a guest investigator at the Woods Hole Oceanographic Institution (WHOI). Biologists know so little about Omura’s whales that nobody has any idea how rare they are, or how many exist. When Cerchio and colleagues, who have been carrying out field studies on marine mammals off the northwest coast of Madagascar since 2007, first saw an Omura’s whale in 2011, they also thought it was a Bryde’s whale. In 2013, they moved study areas and reported more frequent sightings. This was when they detected the distinct markings – unique asymmetrical pigmentation on the head – that made them consider Omura’s whales. Over a period of 24 months the biologists observed 44 groups. During this time, they managed to collect skin biopsies from 18 adult whales. Co-author, Alec Lindsay at Northern Michigan University, performed the DNA analysis that confirmed the whales’ species. Cerchio and colleagues also observed four mothers with young calves. Using hydrophones (microphones that detect sound waves under water), they recorded song-like vocalizations that they suggested could be reproductive behavior. Cerchio plans to return to the field in November to further study the animals’ behavior, vocalizations, and population characteristics. He would like to expand the research area in future studies, working with colleagues at WHOI to deploy DTAGS (Digital Acoustic Recording Tags) and to study Omura’s in other parts of its range. The researchers hope to produce the first estimate for Omura’s population with the work off Madagascar. So far, they have catalogued about 25 individuals through photographic identifications. The research was funded by the Prince Albert II Conservation Fund, the International Whaling Commission Small Cetacean Conservation Fund, and the U.S. Marine Mammal Commission. 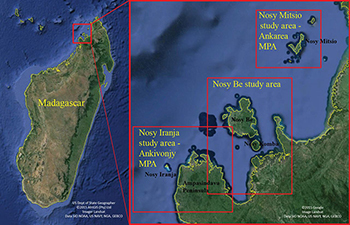 Citation: “Omura’s whales (Balaenoptera omurai) off northwest Madagascar: ecology, behaviour and conservation needs,” Salvatore Cerchio, Boris Andrianantenaina, Alec Lindsay, Melinda Rekdahl, Norbert Andrianarivelo, Tahina Rasoloarijao. Royal Society Open Science. Published 14 October 2015.DOI: 10.1098/rsos.150301.